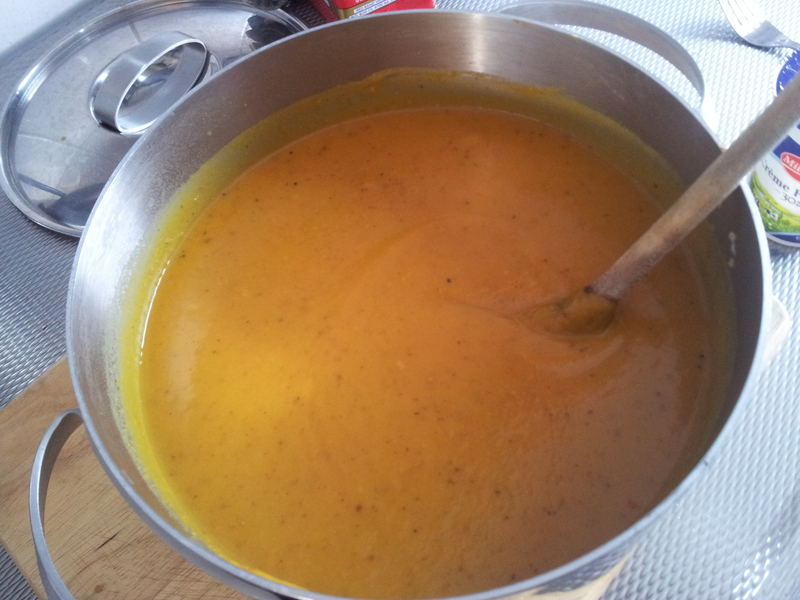 Autumn is here and blazing, so I figuered out it was time to stop neglecting my blog, and make a lovely,harty soup! 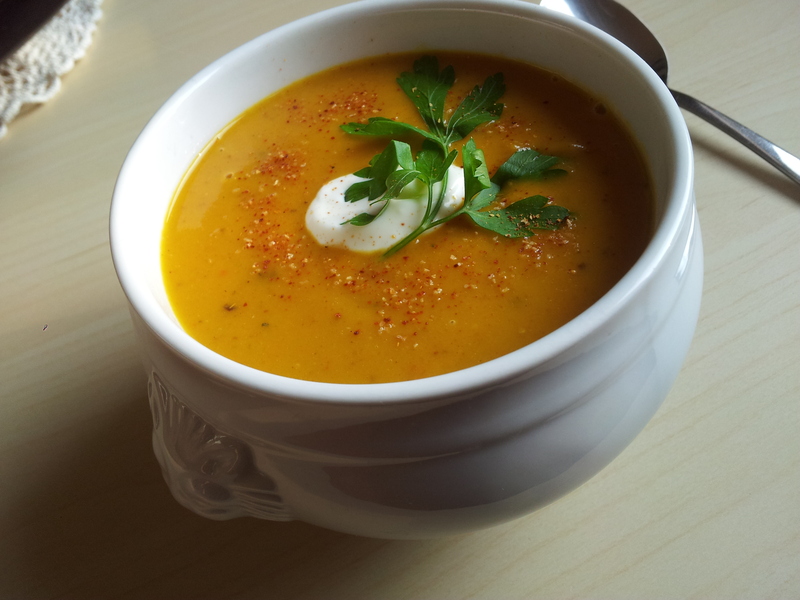 And what vegetable just screams ‘’autumn’’ to you? You’re right, it’s pumpkin. 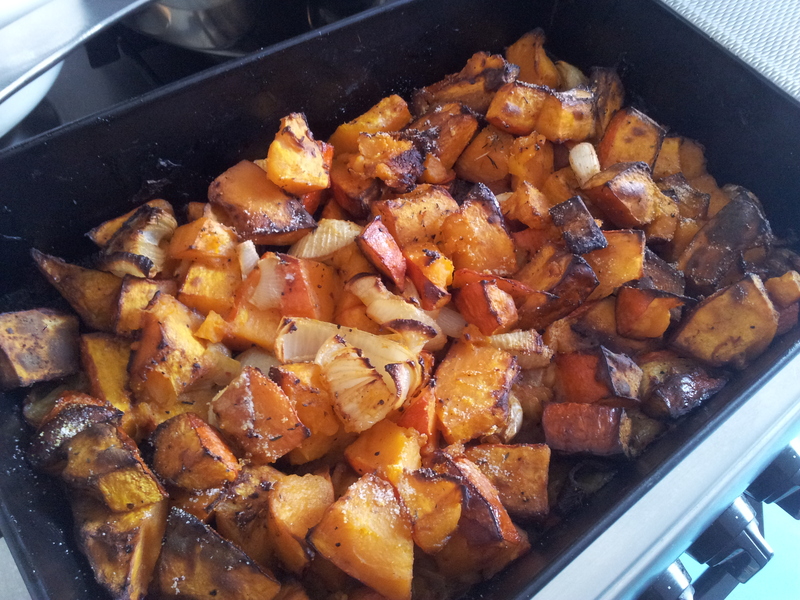 So today we’ll make a lovely roast pumpkin soup. It’s loaded with heart-warming spices, it’s thick and you’ll love it,because it’s just oh-so easy to make! Just cut everything up and let the oven do the hard work. 😉 let’s get started! 5 cloves of garlic, skins ON. And whatever you want to serve it with: f/e croutons etc. 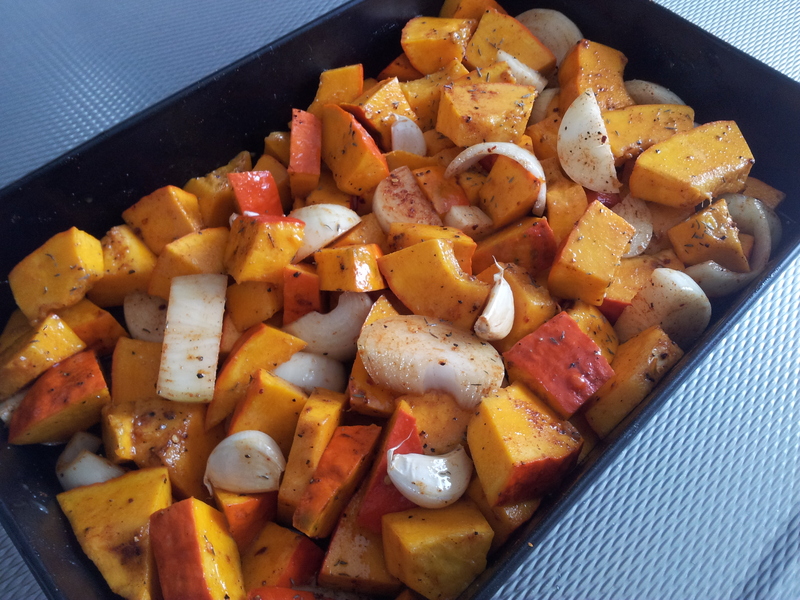 Take your pumpkin chinks,onions and garlic, chuck it into a baking tray, add your oil,honey, ½ tsp of dried thyme, ½ tsp of cumin powder, 1 tsp of paprika powder, ½ tsp of cayenne(or more if you wish) , ½ heaped tsp of curry powder, season generously with salt and pepper,add the water then mix with your hands and pop it into a preheated oven, 180C hot air setting for about 45min or until it’s nicely baked, golden brown and carmelised on the edges! When it’s all nice and baked, take it out of the oven and let it cool until it’s cool enough to handle. Take the garlic cloves out and squeeze the lovely baked garlic flesh out of the skin and into the baking tray. Discard the skins. Tip everything that’s in the baking tray into a pot,add your hot chicken stock (use it gradually or the soup might be too thin,best to add about half to begin with,blend it and decide if you need more). 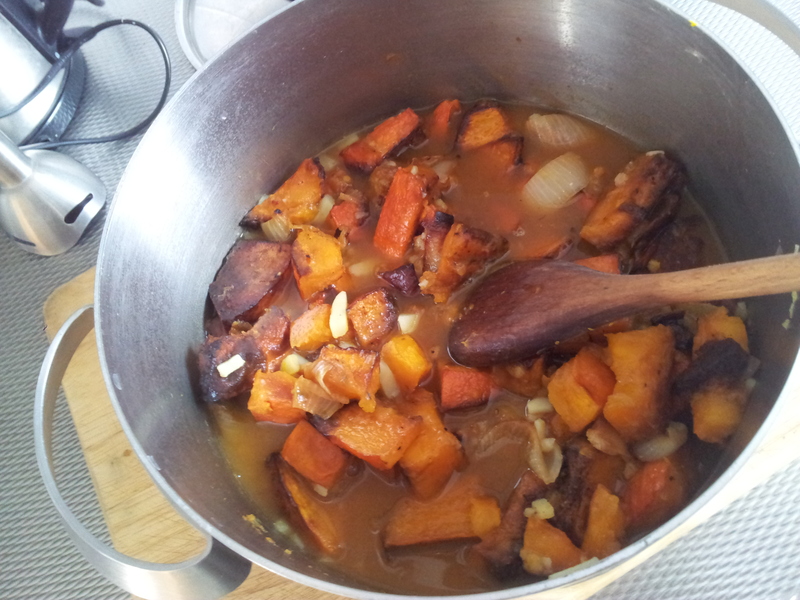 For a whole pumpkin like hokkaido I used about 1l of stock). The flavours marry perfectly and it’s a true match made in heaven. 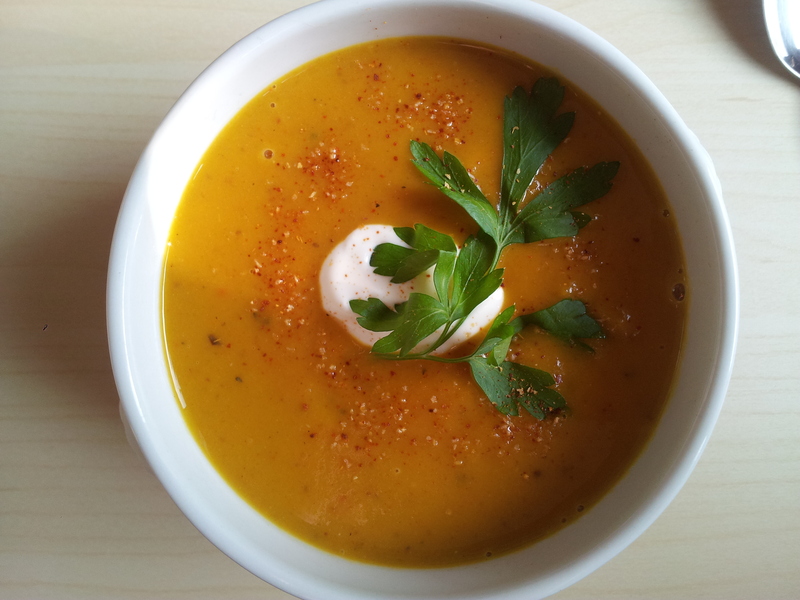 Sweet pumpkin,salty chicken stock,the kick from the spices and sour creme fraiche. Autumn perfection in a bowl! Gotta give it a try. Enjoy!